Hello hg341 and ! My name is Maniac and I will be glad to help you solve your malware problem. If you are a paying customer, you have the privilege to contact the help desk at Consumer Support or here (http://helpdesk.malwarebytes.org/home). If you choose this option to get help, please let me know. I recommend you to keep the instructions I will be giving you so that they are available to you at any time. You can save them in a text file or print them. Make sure you read all of the instructions and fixes thoroughly before continuing with them. Follow my instructions strictly and don’t hesitate to stop and ask me if you have any questions. Post your log files, don't attach them. Every log file should be copy/pasted in your next reply. Help: I Got Hacked. Now What Do I Do? We can still clean this machine but I can't guarantee that it will be 100% secure afterwards. Let me know what you decide to do. If you decide to go through with the cleanup, please proceed with the following steps. 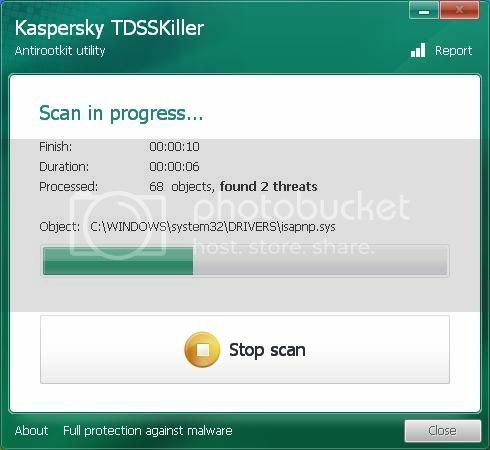 Download the latest version of TDSSKiller from here and save it to your Desktop. 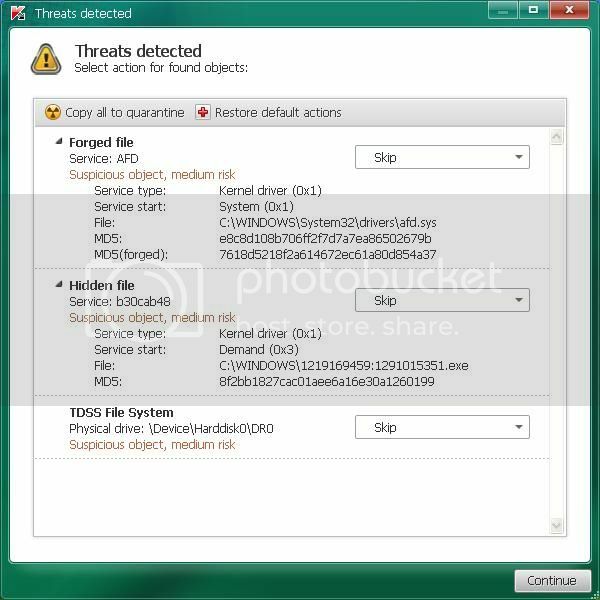 Check the boxes beside Verify Driver Digital Signature and Detect TDLFS file system, then click OK. If a suspicious object is detected, the default action will be Skip, click on Continue. If malicious objects are found, they will show in the Scan results and offer three (3) options. 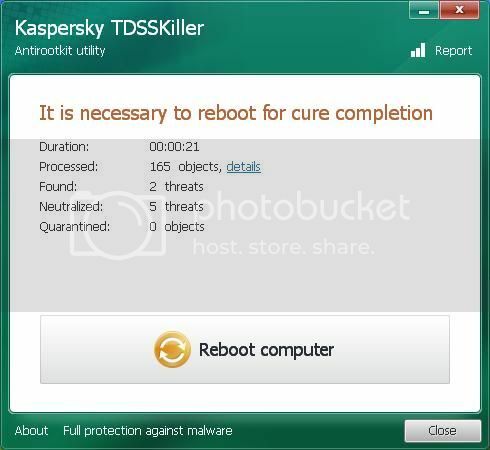 Ensure Cure is selected, then click Continue => Reboot now to finish the cleaning process. Note: If Cure is not available, please choose Skip instead, do not choose Delete unless instructed. 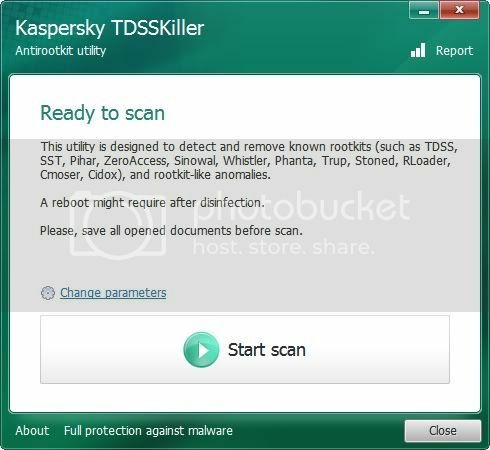 A report will be created in your root directory, (usually C:\ folder) in the form of "TDSSKiller.[Version]_[Date]_[Time]_log.txt". Please copy and paste its contents on your next reply. Go to Update tab and select Check for Updates. If an update is found, it will download and install the latest version. Go to Scanner tab and select Perform Quick Scan, then click Scan. Extra Note: If MBAM encounters a file that is difficult to remove, you will be presented with 1 of 2 prompts, click OK to either and let MBAM proceed with the disinfection process, if asked to restart the computer,please do so immediately. 12:29:04.172	Disk 0 MBR has been saved successfully to "C:\Users\Thomas\Desktop\New folder\MBR.dat"
12:29:04.172	The log file has been saved successfully to "C:\Users\Thomas\Desktop\New folder\aswMBR.txt"
mRun: [RemoteControl9] "C:\Program Files (x86)\CyberLink\PowerDVD9\PDVD9Serv.exe"
mRun: [PDVD9LanguageShortcut] "C:\Program Files (x86)\CyberLink\PowerDVD9\Language\Language.exe"
mRun: [Adobe Reader Speed Launcher] "C:\Program Files (x86)\Adobe\Reader 10.0\Reader\Reader_sl.exe"
mRun-x64: [RemoteControl9] "C:\Program Files (x86)\CyberLink\PowerDVD9\PDVD9Serv.exe"
mRun-x64: [PDVD9LanguageShortcut] "C:\Program Files (x86)\CyberLink\PowerDVD9\Language\Language.exe"
mRun-x64: [Adobe Reader Speed Launcher] "C:\Program Files (x86)\Adobe\Reader 10.0\Reader\Reader_sl.exe"
Next, upload it somewhere, for example in www.rapidshare.com and send me a download link via PM. Save it to your desktop and post it in your next reply. How is your system now? Next, uninstall ESET Online Scanner and manually delete DDS, aswMBR and Kaspersky AVP. If you need this topic reopened, please send a Private Message to any one of the moderating team members. Please include a link to this thread with your request. This applies only to the originator of this thread.